Surfing online, I came across this great work by 20-something Becky Stern. 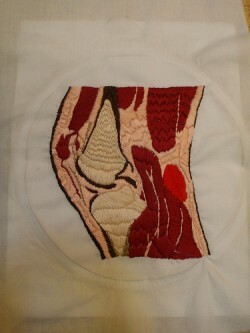 It is an embroidery from an MRI of her kneecap. On her website I found earrings she made out of Vicodin, a plush stuffed animal-like version of her femur, and a copper band aid. I was captivated and interviewed her a bit more about her art. Q: What medium do you like to work in the most? Q: What subject matter fascinates you? Q: So what was up with your leg? Why did you have surgery? Q: Some people would be grossed out by pics of their surgery. Seems like you are not. Have you always had a strong stomach? A: My first knee surgery was when I was 8. I had another when I was 14.
wisdom teeth and knee screws (that had to be removes) in an envelope. is cute and at the same time gross. Q: Do you plan to make other medically related pieces? What about you guys reading this post? Do you ever have daydreams, real schemes, or actual artwork, plays, films, sculptures that you’ve made about your illness? Have you seen other illness related artwork that has stayed in your mind? Any work by young adult cancer patients? Wow–fascinating interview and work. It’s amazing what can be created when you bring two different things/domains together that others hadn’t considered merging before. the vicodin earrings and copper band-aid are pretty awesome. interesting work, interesting artist! I write about my OCD and I laugh at myself and encourage others to laugh at me. I think when you create something that is born of an illness, you are declaring you have ownership if IT rather than having IT own you.